Ronaldinho, Ronaldo of Brazil, Adriano, Pato, Lisandro Lopez, Zanetti, Cambiasso, Luca Toni, Totti, Del Piero, Benzema, Scholes, and Raul. These are just a few of the several great names left off of their respected nations final 30 man roster for this summer. Now some of these guys would have killed to have the chance of going this summer to South Africa (Ronaldinho) and some of these guys turned down the chance due to previous retirement from international football (Scholes) and some of these guys ate their way out of competitive football (Ronaldo & Adriano) and some of these guys had an unfortunate injury at an inopportune time (Pato & Benzema). But when it really comes down to making a World Cup final roster it comes down to, well, a lot of things. For some coaches it is what you bring to the team that no one else does and in other cases it is strictly based on your sole performance over the last year, but several of these guys simply didn’t make the cut because they lacked serious interest in international football over the last few years. And it was the politics of the game that closed the door on their dreams. But one Yank has the perfect solution to the problem. Let all of the overlooked players, old players, players considered too young, the injured players, and players that simply didn’t have a fair chance of making the 30 man roster and lets throw them on one super team that competes with all the other nations for the World Cup. 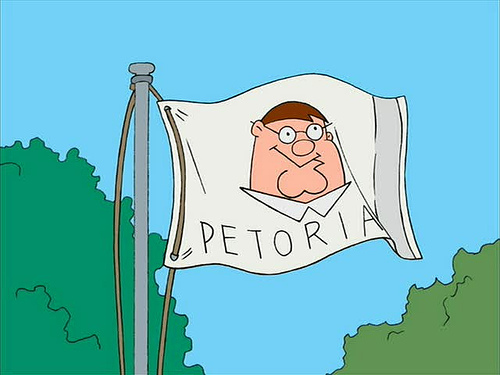 In fact lets name this country Petoria in honor of Family Guy and lets give them New Zealand’s spot in the tournament. I know it is unfair to the Keewees, but with their odds being at around 2,000 to 1 to win the Cup, I think our team of spurned players would do just a little bit better by the odds makers. After all several players on the roster would have already won a Cup and we could always acquire several more who simply didn’t play on a Cup worthy team like Zlatan Ibrahimovic. Sure this idea overlooks certain characteristics that footballers might hold true to their nation like loyalty, but we are talking about something greater then any single nation playing for the Cup here. Were talking about a true super team of supposed rejects. Were talking about making a melting pot of fantastic football and putting them up against the rest of the world. We are talking about the birth and berth of a nation here. We are talking about Petoria.